There is a funny thing that happens when humans create new technologies– We get really excited!! Our inner geek pushes its way out and we find ourselves browsing articles, watching videos, and getting lost in the what-if’s and imagine-a-world-where’s in which said technology pervades our lives and how we do things. When we think ‘future state,’ we think about a seamless experience where we only use the technology for utility/convenience; to accomplish or connect. What prerequisite templates exist in our minds usually come into play here– think the touch screens in the matrix, or the transporter from Star Trek– and we compare these media-defined preconceptions with what we think we’ve gleaned through our impression via the product’s marketing collateral. This tendency towards [over]-excitement is not new, and likely, somewhat counterintuitively, the impetus for another feature in human-technology interaction: our slow adoption. Adoption itself depends on a few things, primarily utility and ease. So while B.S.O.S (Bright, Shiny Object Syndrome)– novelty in general– is intoxicating, the potion wears off if novelty alone is the only benefit. This drop-off, this chasm between where the excitement falls, and the resistance to integration rises is where I will be focusing my research. 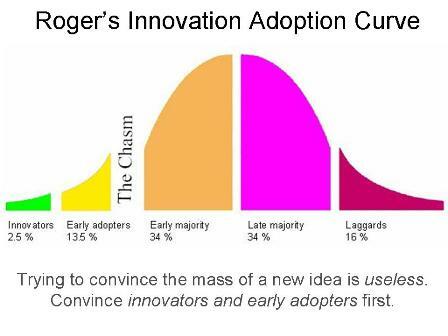 Consider the classic adoption curve developed by Everett Rogers in 1962, which remains the standard today. I would propose this curve exists on an individual level– where the chasm is discarding use; and on a communal level where the chasm represents the jump from BSOS to mass-recognition of value. New technology requires something else to gain majority adoption: a business model. I use business model somewhat gratuitously here, and what I really mean is a model to scale to universal utility. The invention of fire likely saw a more rapid adoption than did that of the ornamental necklace. While both are important, fire was arguably 1) more accessible to more people across more regions and 2) more useful for survival to the species. Today, luckily, we are somewhat less concerned with survival, but the same principal still exists as the basis to how we integrate innovation into our lives: Is it useful and will it serve an unprecedented advancement for me and my people? Am I giving humanity too much altruistic credit? Aren’t we more selfish than that? Maybe– but this brand of altruism today has dollars attached. We’re talking business models, remember? Forward-looking venture capitalists and enterprise brands keep their proverbial finger on the pulse of new technologies for a few reasons, namely to drive revenue, efficiency, or notoriety. Without promise for adoption (read: utility, increased efficiency) by the masses, most investor entities will pass. So to pass or to play? This post serves to set the foundation for my research on the business models of the Internet of Things. I believe this space is exemplary of the chasm between early B.S.O.S. and majority adoption; of excitement vs. investment. The Internet of Things is incredibly cool, but where is the business value? What are the barriers to adoption? What are the drivers? Beyond quantified self and RFID sensors, is this truly the next evolutionary phase of connectivity and communications?